Every now and then, we come across some weird vibes. Your environment just doesn’t feel right. The energy is off. It feels heavy and dark. Maybe you can’t put your finger on why, but being in your home, office, hotel room, or wherever: it gives you a bad feeling. Sometimes people bring bad vibes into our world and they linger. These vibes can fester and create negative energy that drags you down in life. So, how do you get rid of them, short of moving to a new home or otherwise leaving the negative space altogether? 1. Start by airing everything out. Open up all the windows and create a draft. Let the fresh air come through, even if it’s freezing outside. Shake out the pillows and blankets. Turn on all fans and get that bad vibe moving and the stale air out. 2. Smudge it with sage. Burning sage, known as smudging, has cleansing properties. Sage is a powerful tool that has been used for over 2,000 years in cleansing rituals. You can sage your home, your office, and your body. It’s like taking an energetic shower and giving the energy in your home a super cleanse. Just burn the sage and fan it in the house or your room. If you don’t like the smell, open windows to air it out a little longer afterward. Smudging is an ancient practice that rids your environment of darkness and negative energy, leaving your home cleansed and ready for good vibes. 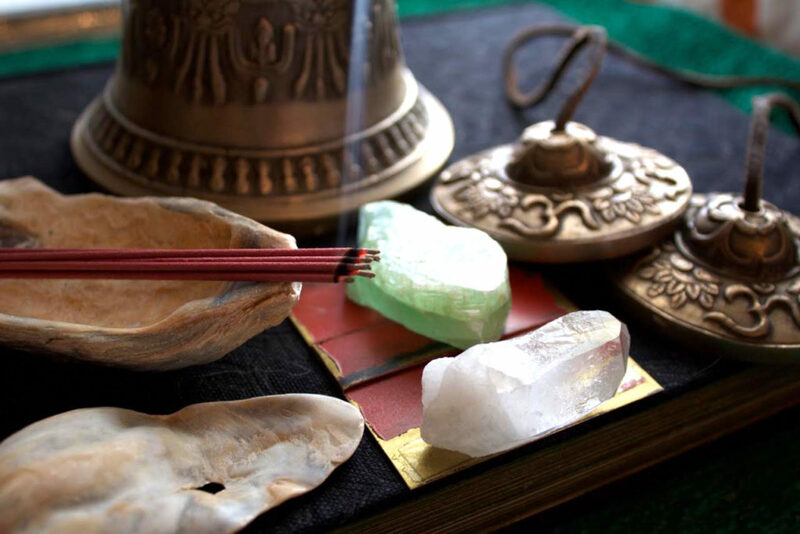 Nag champa is a particular type of incense that creates a calm and serene atmosphere. People use it for meditation to produce a sacred space where we can expand our consciousness and develop our sense of calm. It creates a serene atmosphere in which we live, create and experience joy. 4. Purify with essential oils. Aromatherapy cleanses away negative energy in spaces. The oils can be sprayed with a spray bottle or put in a little diffuser in the corner of a room. Either method lets the essential oils and their cleansing properties evaporate into the room, purifying the space and leaving it clear for positive energy. Any dark-colored stone repels negative energy. Black Tourmaline is known to ward off and dissolve negative energy. They can be kept close to electronic devices or anywhere around the house. Rose quartz, on the other hand, replaces negative emotions with positive ones. It’s always good to have one of each around the house. 6. Burn Palo Santo wood. Palo Santo has been used in ancient South American traditions both to ward off bad energy from your home, and bring good luck. It removes bad spirits and brings back positive energy. Palo Santo is best used when meditating or removing negative experiences and misfortune. If you’re feeling weighed down by the negative vibes in your surroundings, try one or all of these tricks and let me know how it worked for you. A simple cleanse of your space can make a huge difference in your world.